Portland, Oregon. We had big expectations. The food. The coffee. Kinfolk. The bikes. The hipsters. And the rain. For Zuzi, Portland was a place that she always wanted to visit ever since she studied abroad with some US students and they just sang praises of it. Well. We got the rain when we landed, but otherwise we got really lucky and by chance picked the nicest week of the entire fall (as all the locals told us). Let’s not kid ourselves. It helped. A lot. Still, we absolutely loved our stay in Portland. The food. The coffee. The air. Kinfolk. The bikes. And the people, especially the people. Having arrived from New York, we immediately realized a few things about Portland. First, the air is somehow “greener”. You can smell the forests around it. Second, the people are super nice. After every visit to a shop or a restaurant, Zuzi was shocked by how good the service was and how nice the people were. It was not bad in New York, either, mind you, but Portland was even nicer. Made you feel welcome, although - and that became a theme throughout our stay - the locals always asked us why did we choose Portland for our US stay? They could not understand. Third, we realized that a week was not enough in Portland, despite the smaller size of the city. There was just so much to do! We spent the first two nights of our stay in the Jupiter Hotel, an older motel remodeled into a hip, cool place loved by the locals on the eastern side of the river. We realized that we might be a bit too old to enjoy being “in the middle of it all” as advertised on the website - every night is a party night in the parking lot of the Jupiter, and you have the front row seats in the rooms. But hey - they have to clear the lot by 1:30am, so you’ll be ok. Actually, it was fun. After the long flight the evening before, we were in dire need of coffee the first morning. So we headed over to the original Heart Coffee cafe and roastery. A very popular spot and really good coffee made by skilled baristas. We could not wish for a better start. We did some research beforehand but the weather was pretty bad so we decided to hit some shops from our list. We passed Voodoo Doughnut, a local staple. What a coincidence - Jan was just craving one. It seems that no article about food in Portland can be published without mentioning Voodoo Doughnut, but honestly - it is fun to see but the donuts are not that great. All the locals laughed but recommended Blue Star for donuts instead. And then the rain got stronger so we decided to walk in the biggest independent bookstore in the world: Powell’s City of Books. Wowza! We could spend hours there… and we actually did. It is a local institution and for good reason. The rooms are color-coded and you can get a map of the store to avoid getting lost in the aisles. Fantastic. We returned to Powell’s several times throughout our stay. Then we did some window shopping at the Union Way arcade but more on that later. We went to Clyde Common and had a simple and quick lunch there. Despite the simplicity, it was an indication that the food would be great here in Portland. It stopped raining by the time we finished our lunch and we craved something sweet. We decided to have a scoop of the famous Salt and Straw ice-cream. It required some walking but nothing stands between us and any dessert, and we could hit some shops on the way. We could sample everything so we had more than one scoop just by tasting. Our favorites? Pear and blue cheese, and strawberry with balsamico and black pepper. We don’t need to tell you this was not our last visit. And if you know us, you know that after dessert, we craved something savory. So we had dinner at Olympic Provisions. Great dishes, good selection of natural wines, boards of charcuterie, cheeses and pickled and fermented vegetables, all of them made in-house. That was a theme in Portland: all the restaurants we visited bought little but made everything from scratch, and we mean everything: bacon, ham, bread, butter and all. What’s not to like? The next morning, we started our first home swap in the US with the lovely Amy and her family. She drove us from the hotel to her huge house above the city and gave us the keys to her huge car. Talk about the American dream! We were also cat-sitting the lovely (and slightly overweight) Lizzie the Cat. We had coffee at Barista cafe in the morning, which was pretty bad on all fronts (a dark roast made too hot by a barista with an I-could-not-care-less attitude), so we drove to the city to explore some more and had coffee at Stumptown right next to the super-hipster Ace Hotel. The coffee was great but we liked the coffee we got at Heart the day before better. 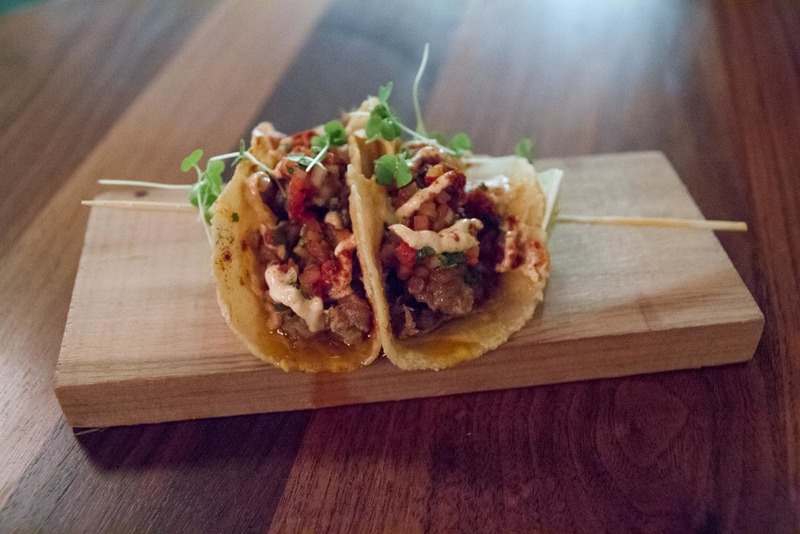 We wanted to tap into the allegedly great food truck scene in Portland, so we hit the few places in downtown Portland to see what's on offer. Obviously, food trucks are loved and cherished in Portland and people love to eat outside. Having walked around and read some recommendations, we chose Khao Man Gai by Nong, a lovely Thai lady. The chicken was nice and tender (no skin, though) and the sauce was great. Very messy, but really nice comfort food. We craved dessert afterwards so we went to Maurice and had the black pepper cheesecake with small apples and ice-cream. The lemon souffle looked great, too. For dinner, we went to Ataula, a fairly recent entry on the Portland food scene opened by a young chef from Barcelona. It was full when we got in and we had to wait for a table for about half an hour. The food was basically tapas-sized dishes meant for sharing, which means we ate too much, of course. The waiter suggested the cocktails, which we found generally to present better value than the wine, so we had two boozy cocktails from the menu. We liked the oxtail ravioli with porcini and caramelized pineapple sauce, the super fresh pork tacos and the Iberico ham croquettes the best. We left stuffed, having ordered six dishes. We also liked the personal attention: the chef visited our table and asked whether we liked the food. We did. On Saturday morning, we did the right thing and visited the farmers’ market that everybody was raving about. It was just too cool. Perhaps the size of Prague’s riverside but in a small park near the university campus, the market was a sunny, friendly affair that really did highlight the local and seasonal produce. Our favorite stand was the apple stand: maybe a dozen types of apples and half a dozen pears on top of it. Throw in some hazelnuts and you’re in Oregon autumn haven. The jam stand with dozens and dozens of jams and marmalades was also pretty cool. We did have breakfast there: Zuzi had the fall vegetable salad while Jan had the bagel with cream cheese, jam, bacon and arugula. Very tasty. Then it was time for coffee, so we crossed the bridge to the Eastern side of the town and had two cappuccinos at Coava. The cafe shares a big industrial place with a bamboo furniture producer and draws in crowds of younger creative types that tend to work on Apple laptops. What is great about Portland is the outdoors, so we went up above the city to the International Rose Test Garden (Portland is known as the “City of Roses”) and the Japanese Garden. Beautiful. Sunday morning we slept in late so we ate brunch at home. Notable purchases for the event: the walnut croissant and blueberry scope at the Nuvrei cafe and patisserie. They we both good and we came back later for more. Anyway, after some serious shopping, we headed for dinner over to Pok Pok, one of the most loved restaurants in town. Calling Pok Pok, a Thai/Vietnamese place, a restaurant is a bit of an overstatement: half of the tables are under tents and people ate in their outerwear because at night it was not particularly warm. What was hot, however, was the food. Out of the four dishes, we liked the lamb salad the best, along with their famous chicken wings. Pok Pok is a great street food place with a noisy, happy atmosphere. Go there if you like spicy food. On Monday we decided to visit the wine country. We did expect pinots but not the wonderful scenery of the fall trees turning into wonderful shades of yellow and red. We visited two wineries: Stoller and Archery Summit, both within five miles of each other. Loved both. The first one had a very modern tasting room with sliding windows that would open the room into the great outdoors, which must be great in the summer. The second one had outdoor tables with a fantastic view of the entire valley and reminded us of some of the wineries we saw and loved in Styria. Anyway, we loved our short time in the Oregon wine country. Would we retire there? You bet! On our way home, we decided to stop for dinner at Departure. We have a confession to make: we absolutely love Top Chef and are big fans of Gregory, the executive chef, who is a contestant on this series of the show. When we saw him in the restaurant, we wanted to run over and ask him about the results ahead but decided not to. Being deported is not the kind of thing you want just after a week or so in the US. Anyway, we did love the food. Our favorites were the beef short rib steamed buns with bbq sauce and the crispy pork belly with pickled cherries, ginger and pumpkin seeds. Tuesday was our last full day in Portland, and the weather dramatically changed for the worse, with chilly and strong winds preventing us from exploring the last districts of the town. We did spend lots of time in Powell’s City of Books. We also checked in to the Ace Hotel for the last night. We did not like it so much. Sure, we do understand hip, but you need some basic amenities like insulated windows and steadily running hot water to be cool. But truth be said, the lobby and Stumptown coffee next door were great. And at least we have some funny stories to tell when we get home. 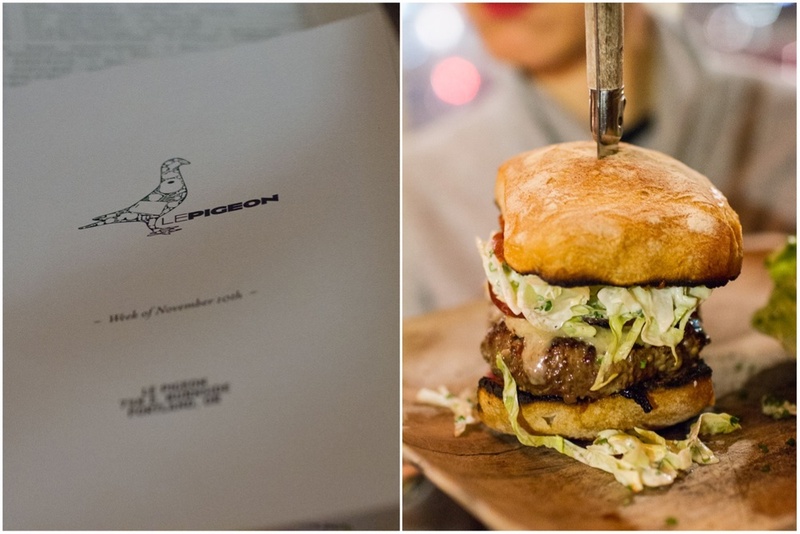 Our last Portland dinner was at Le Pigeon. It is a tiny restaurant near the Jupiter hotel but luckily, we played it smart and had reservations. The food was fantastic. Portland does not have a single Michelin star restaurant, or a Bib Gourmand, for that matter, and we have no idea why. We had two foie gras dishes at Le Pigeon (knowing that we were moving on to California and we would certainly have no foie gras there), and the seared foie gras with cinnamon raisin toast, chestnut and bacon was outstanding, just as their staple dessert, the foie gras profiteroles. We ordered the burger, which was great, too, and served with butter lettuce salad dressed in a blue cheese dressing. The squid and escargots were nice, two, but the highlight was the celery root with and truffle-infused puree. Fresh and full of flavor. Good and creative vegetarian cooking is something we dearly miss in Prague. 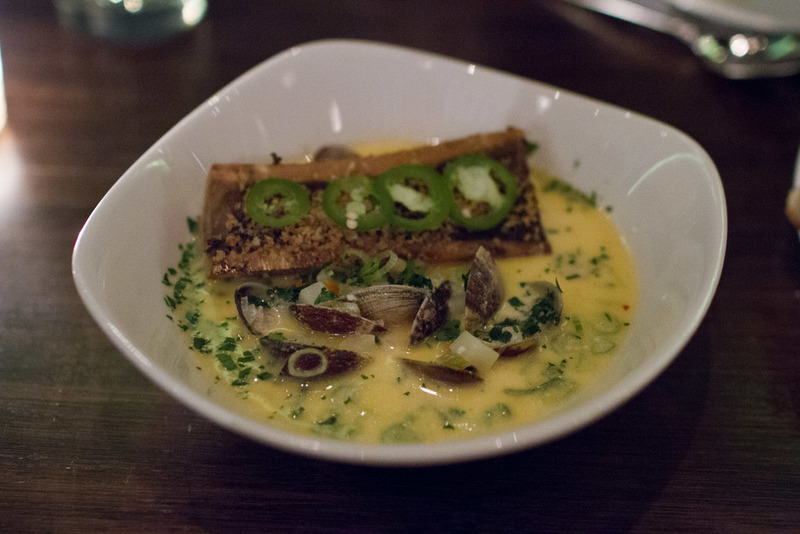 Overall, we really liked our dining experiences in Portland. The restaurants were mostly casual affairs and ready for walk-ins, although getting into the most popular venues did entail some waiting. Many things were done from scratch using local and seasonal ingredients. There was also a sense of pride from the chefs and the staff: people working in Portland restaurants simply loved what they did and the level of cuisine was very high in our opinion. And that’s it. The next morning we were flying out. The temperature was 1C/34F, windy. We were flying to somewhere warmer. We were flying to San Francisco.